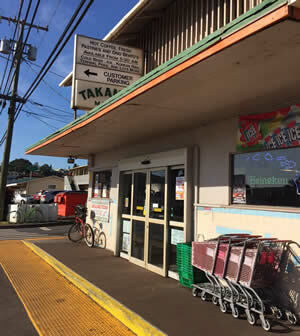 “The Little Giant of Happy Valley” has been serving Maui since 1946. Home of the Mini-Bentos, Hawaiian Food, Poke, and Sashimi Platters! Drop by and enjoy Maui’s best bentos, plate lunches and poke! We have specials every day – come by and see what’s cooking today! When you want the very best! Dani’s Catering offers the finest local food delivered to your venue! Voted Maui’s best catering service year after year, Dani’s prides themselves on delivering top-notch food and customer service to all of Maui. Want to have a party but have no place to have it? We can help! You can hold your catered event in our banquet hall and let us deal with the details and clean-up! Call us at 808-242-6652 to reserve the hall for your event. This place has got it all. The best thing about it is the tako poke and the ahi poke. My brother swears by the salt poke. Fresh produce and one of the only real butchers left on Maui. This is hands down my favorite store on Maui. Poke….YUMMIE! Spam Musubi….YUMMIE! Lunch plate with fried chicken, spam, sausage, corn, and rice….YUMMIE! 5 stars for the amazing tako poke. I went here 3 consecutive days for the tako poke. Office hours are Monday thru Friday 8 a.m. to 4 p.m.